from our well established gallery in Redhill, Surrey. We are pleased to stock a number of "Little Houses" Prints by Susie West. New for November 2017 - We have added a Virtual Tour of the shop to the website. Just click on the Virtual Tour Tab and navigate your way around the shop. ... "friendly, professional service in a relaxed and welcoming environment. We will spend time with you to establish your specific requirements and to discuss the available options"
We have made a few changes to the layout of the gallery, and expanded the range of products we offer, including gifts. Please take a look by selecting the "Virtual Tour" tab. We have a wide range of high quality mouldings, specialist glass and archival mountboard to choose from, as well as ready made frames. 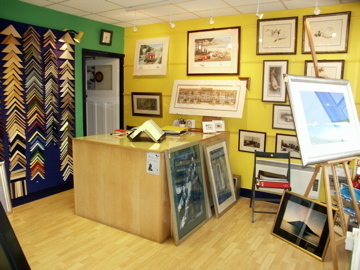 We are experienced in framing a very wide variety of media, and are pleased to help you with your selection and layout. Karen Perry, Pam Baker, equine artist Sally Martin, Wendy Percy and Andy Maitland. Becky Mair, Mary Ann Rogers, Sue Howells and an encaustic piece on canvas by Tony Owers. We also stock a wide range of Greetings Cards. All images displayed on this website are subject to copyright.